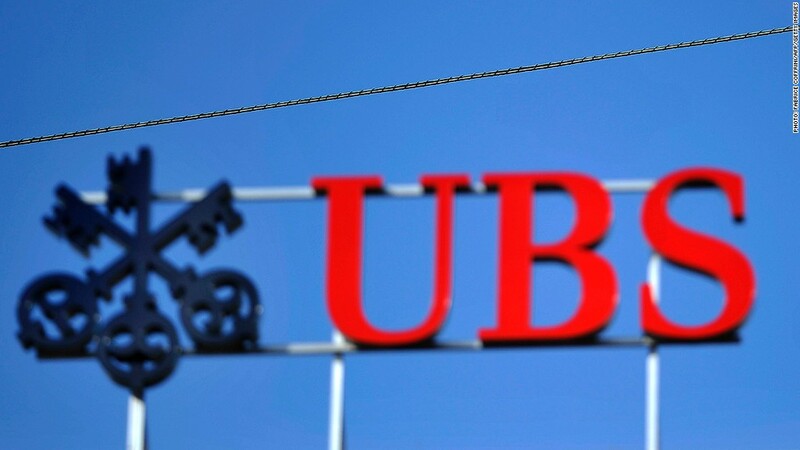 Two former UBS traders face criminal charges as part of a sweeping case announced Wednesday in which the Swiss bank agreed to pay $1.5 billion after admitting to manipulating global benchmark interest rates. The settlement follows an investigation by regulators and law enforcement officials around the world into the setting of the London Interbank Offered Rate, or Libor, and related interest rates. U.S. Assistant Attorney General Lanny Breuer called it "one of the most significant scandals ever to hit the global banking industry." The payment settles government claims in the United States, the United Kingdom and Switzerland. The bank has agreed to a non-prosecution deal with the U.S. Department of Justice covering all its subsidiaries except UBS Securities Japan, which pleaded guilty to one count of wire fraud. The investigation revealed extensive misconduct stretching from 2001 to 2010 involving at least 45 UBS staff, including senior managers, who sought to influence rates to benefit the bank's trading positions and make it look stronger during the financial crisis. UBS also colluded with other firms, making corrupt payments to outside brokers worth £15,000 per quarter over a period of 18 months to reward their assistance in fixing rates. The two UBS traders -- Tom Alexander William Hayes, 33, of England, and Roger Darin, 41, of Switzerland -- are currently abroad, and the U.S. will seek their extradition, Breuer said. Both have been charged with conspiracy, and Hayes has also been charged with wire fraud and a price-fixing violation. Contact information for the two men's attorneys was not immediately available. "We deeply regret this inappropriate and unethical behavior," UBS chief executive Sergio Ermotti said in a statement. "No amount of profit is more important than the reputation of this firm, and we are committed to doing business with integrity." Neither Ermotti nor UBS chairman Axel Weber were at UBS during the Libor-rigging period. Ermotti has begun a major restructuring, including shedding 10,000 jobs, aimed at shrinking UBS investment bank and focusing on wealth management. The fine is the second biggest in banking history and more than three times the size of the penalty imposed earlier this year on British bank Barclays for fixing Libor. It follows a series of expensive mistakes for UBS (UBS). Libor is a collection of rates generated for various currencies across 15 different time periods. The quotes are then used as benchmarks for roughly $10 trillion in loans and some $350 trillion in derivatives. For example, an adjustable-rate mortgage might require you to pay interest based on a Libor rate plus 2%. To set Libor rates, groups of banks are asked what interest rate they would have to pay to borrow money for a certain period of time in a certain currency. In June, Barclays (BCS) admitted to manipulating Libor to appear stronger during the financial crisis, deliberately understating its borrowing costs, and to benefit trading positions tied to the rate. As part of a settlement with U.S. and U.K. regulators, the bank agreed to pay more than $450 million. Barclays chief executive Bob Diamond and chairman Marcus Agius lost their jobs as a consequence. But the scandal is bigger than just one or two firms. In addition to Barclays and UBS, more than a dozen other banks involved in setting Libor are being investigated by authorities around the world, and further penalties are expected. Among those facing scrutiny are Citigroup (C), Deutsche Bank (DB), JPMorgan (JPM) and HSBC (HBC). At UBS, employees attempted to manipulate rates on hundreds of occasions, during some periods "on nearly a daily basis," the Justice Department said. The case documents include numerous excerpts from emails and online chats in which bank staffers discuss the scheme. "mate yur getting bloody good at this libor game," one broker told a UBS trader in a chat message. "think of me when yur on yur yacht in monaco wont yu[?]" The British government is in the process of implementing the findings of a review of Libor, which include transferring responsibility for the rate-setting process from the British Bankers' Association, a trade group, to a new administrator regulated by the Financial Conduct Authority. The banks that set Libor are also facing a blizzard of legal actions from plaintiffs who claim they lost money on Libor-related investments due to the benchmark's manipulation. Ermotti said it was too soon to say whether clients had lost out as a result of UBS's behavior, which he described as "an industry issue." "We are far from having an understanding of the effect of the actions of multiple institutions on the actual rate fixings, which one would need to know before trying to determine whether or how clients were affected," he said in a memo to staff. UBS said Wednesday it expected to make a loss in the fourth quarter as a consequence of provisions for litigation and regulatory issues, but predicted pre-tax profit of $2.75-3.3 billion for the year. Just last week, London-based lender HSBC (HBC) agreed to pay $1.9 billion in a settlement with U.S. regulators over money laundering, a record for a case involving a bank. UBS was fined nearly $50 million by British regulators last month after it failed to prevent a rogue trader from running up $2.3 billion in losses last year. In 2009, the bank paid $780 million as part of a deferred prosecution agreement in which it admitted to helping U.S. taxpayers hide money from the IRS.